Finding an ancestor's home is not only thrilling, but can also lead to great information about the people who lived there. If that home has a historical marker, much of the research on that home may already be done. All of that hard work of applying for that marker or historical designation could mean a goldmine of information. Historic home markers vary depending on the organization issuing the historic status. Some markers are small and meant to be hung near the front door of a home. These may only have the year the home was built and a brief notation about the address or historic program. Other markers are larger, placed prominently on the property and contain a great deal of information on the historic significance of the home. When a marker is discovered, the next step is identifying which organization was responsible for providing that marker. Once that is done, gaining access to the application and corresponding files, if any, is the next step. We will explore two main types of historic marker programs: A town historic registration program which requires homes to be of a certain age, and a state program which requires the home or structure be of historical significance. The details you will find in the applications will vary and could be dramatically different depending on the regulations. The application itself will typically require personal information about the person submitting the application, usually the owner, and basic information about the home. Some programs require a home to be over a certain number of years old, usually 75 or more although this does vary. To prove a home is of a certain age applications usually require proof in the form of deeds, mortgage records, and tax records. Chaining the deed from the current owner to the original owner requires locating and pulling deeds and filling out a worksheet or other paperwork showing the chain of ownership. Within these records you may discover family names as buyers, sellers, or witnesses to a sale. Mortgage and tax records support the information found in the deeds by providing additional evidence that a home was built on a piece of property and it was owned by someone as far back as the deeds show. Plat maps or Sanborn Fire Insurance Maps may be included in the application as additional proof of the age of the home. Both types of maps provide researchers with additional details about the home and neighborhood at the time they were created. Photographs may be required as part of the application. Applicants may be encouraged to send not only current photos of the home but historic photos if they have these. Some applications ask for a description of historical significance to the home or property. You may discover biographies on former owners, historical information about an event that occurred in the home or on the property, or other information showing the historical significance of the home. As part of the process of applying for historic status, some owners ask that not only the application be completed, but hire a researcher to conduct and write a full house history. I had a client request that I locate information to not only complete the application process but also write the home's history in book format. At the end of the process the client received two copies of the application materials and two house history books. One copy was hers to keep and the other to be submitted to the local historical society for historic status consideration. The book became part of that home's file at the local historical society. The book I created for the client contained a history of the property ownership from past to present and within each section of ownership, information on the owners and his family. She allowed me to photograph the inside and outside of the home. She specifically requested photographs of original pieces such as doors, stained glass windows, and door hinges. A description of changes made to the home were included based on the current owner's knowledge and records provided to her from former owners. Building permits, if they had been available, could have also been consulted. Sanborn Fire Insurance Maps provided some of this detailed description. In the appendix were copies of all the deeds, mortgage records, tax records, census records, vital records, photographs obtained from the client and area repositories, biographies on former owners who were significant within the town. Everything included was cited and a bibliography was provided. Anyone seeking information on this particular home would find a wealth of information within this application file. Don't rule out the possibility that an applicant may have also donated a full house history as part of the application process. Some of the same records you find in a local application may also be found in a state application. Of course, requirements vary but it is worth investigating. State programs may require a home or piece of property to be of certain age. They may also require an applicant to prove the historical significance of the home or property on which the home was built. The application may provide historical details of which you were previously unaware which may lead to new research opportunities on your family. Some agencies require a narrative be written with proof cited in addition to an application. 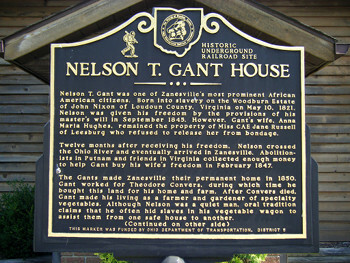 The Ohio Historical Society runs the Remarkable Ohio historical marker program. They require a narrative be written discussing genealogical information concerning prior owners or a specific owner in a specific time period. Also required is information on a specific historical event as well as the history surrounding this event. These histories may include names of your ancestors. Ohio also requires you to explain why the home or people associated with the home, is unique, significant, or special. Within those details you may discover new research paths to follow for both your ancestors and their home. As part of the Ohio program, a bibliography of sources used is required which may provide additional resources for your research. All facts must also be cited which may provide a researcher an easier time locating records for the home or their family. Not all applications are the same so within each you may find details you will not find in another. For additional information on the home or owners, seek out newspaper articles, information about the specific type of home, the architect, and local genealogical and historical societies and libraries for additional information. Remember to use what you find in applications and corresponding files as a starting point in your research. Be sure to verify the information contained in the files and see out additional record sources. A few examples of historic marker programs can be found at the following websites. Search online for "historic plaquing programs," "historic register status," or "historic home status" for your town or ancestor's town and state to see if such programs exist.